Posted by Chris Fordyce. Feb 24, 2018. The team at RosterElf are excited to announce our new Reports section is now live. We would like to thank the 100's of customers who have provided invaluable input into this new functionality as we have worked to understand reporting needs across a wide range of industries. Today, the Reports section goes live with three reports: Availability, Rostering & Payroll and Staff. 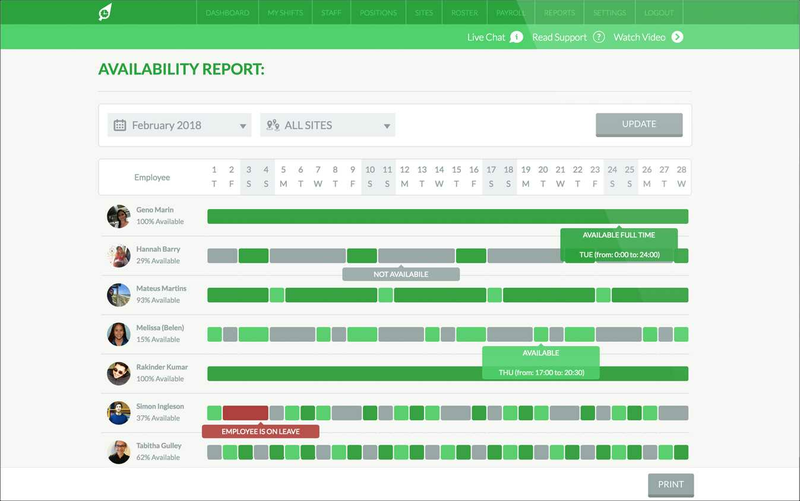 The Availability report provides a simple visual way to get an understanding of the availability of your employees in a given period, taking into account their availability to work submission as well as approved leave applications submitted by RosterElf. The report offers you the ability to select a period as well as filter by site to give you powerful insights into your businesses labour coverage. It also includes a availability percentage score for each employee so you can see at a glance the availability level for each of your staff. You can simply view this data on screen which appears as colour coded bars, or print the report out to keep on record in your business as future leave requests are made. This report also includes a availability percentage score for each employee so you can see at a glance the availability level for each of your staff. This one simple report gives you the ability to export rostered times, clock-in-out and payroll approved times in a couple of clicks. Simply select the date range and the sites you wish to include and RosterElf will generate a custom report which you can print as a PDF or export into CSV format. The Rostering & Payroll report includes a complete history which will ensure handling pay queries or simply conducting business reviews is easy. The staff report provides a easy way to export all your employee information including name, email, mobile number and date of birth for import into other software, email or systems. This data can be exported as a printable PDF or CSV file. You will also notice, we have 3 more reports with a "Soon" label: Budgeting, Leave and Shift Swaps. These reports are in progress now and we will let you know as soon as they are live on your account. We look forward to sharing a lot of new updates like this in the coming months.